A large crowd assembles in Ghana. Not a voice interrupts as a familiar national figure graces the podium. As he begins to debunk false hysterical myths about Africa, he also introduces his next innovative plan to help return the continent to global prominence. With a lifetime of international work that has spanned over 30 years, Dr. Kingsley Fletcher believes that he has now arrived at the pinnacle of properly executing his passions to reform Africa for the better. "Africa needs partnerships, not handouts...and I know that we are very capable of doing the former," Fletcher says about returning the region back to a time when it did not lean so heavily on international assistance. "Unlike many parts of the world, Africa has been internally faced with a lot of health, social, and financial setbacks that are not just attributed solely to our past imperialism or colonialism - but poor current government leadership and a lack of investment in innovation." For Fletcher, also known as Drolor Bosso Adamtey I in his native homeland, his knowledge and expertise in helping to eradicate many of the issues Africa faces came from traveling abroad and learning of the endless possibilities. Growing up in the greater region of Accra, Ghana from a family of prestigious traditional leaders, a teenage Fletcher would first set off to travel, study, and do international missionary work before eventually accepting his royal responsibility. "I knew that the time would come when I would ultimately become the Suapolor of my Se (Shai) Traditional Area, but I first wanted to learn the world my nation and my people would be facing." In the early 1980s, after studying in England and doing missionary work in Africa, he would eventually head to the United States where he would do faith dialogue in North Carolina. This would lead to him founding Life International, a multicultural ministry that represents over 60 nations. It would be during this time that he would meet his wife and start a family that would eventually lead to raising two now grown-up daughters. "My family brings me great joy and the key to keeping our balance between work and care is supporting each other along the way," Fletcher says of his life lessons to keeping an ambitious career and personal life maintained. Throughout the decades, Dr. Kingsley Fletcher's quest to exploring the world and applying those experiences to improving the quality of life for Africans all over the continent would be immersive. He would go on to be the Chairman of First Group, FirstBanc Financial Services in Ghana and later the former Chairman of Ghana's largest private television station, TV3 Network. And while his lucrative entrepreneurial empire would lead to him learning a handful of languages, releasing publications, and building relationships and connections that would inform and advise leaders from Africa, Asian, and North America - Fletcher realized that his influence could also be more effective for another group of people, the youth. "As I began to grow and build with many leaders and businessman around the world, I soon realized one of Africa's major mistakes...we don't spend much time investing in our future, the children," Fletcher said of what lead to him shifting gears in the second half of his advocacy work. "I realized that there needed to be a major paradigm shift in how the region sustains - individual success is not enough to influence the future...youth development would be the ultimate way." After having served his term as the Special Advisor to the Assistant Secretary General and Director of the United Nations Development Program-Africa, Fletcher would later become the founder of Life For Africa, a non-profit humanitarian organization dedicated to implementing programs in health care, education, economic empowerment, and community/society building. It would be in this moment that he realizes a strength and opportunity within himself that would become a great asset in his advocacy, the power of education. "Education is what is going to save Africa above anything else, not international aide and constant dependence, but liberating ourselves by informing one another," Fletcher says on his newfound pursuits. 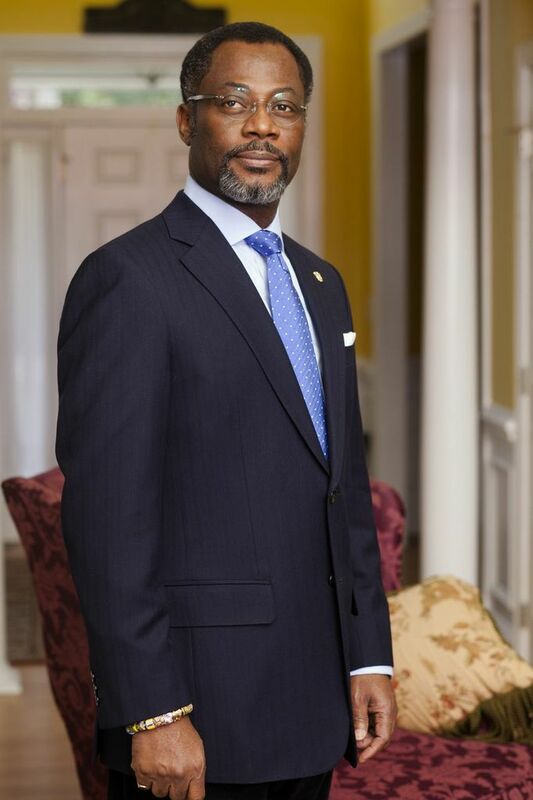 After recently receiving his Doctorate degree in Education with a concentration in Social Justice from the University of Massachusetts, Dr. Fletcher would have the honor of being the first Chancellor of University of Professional Studies Accra, Ghana, one of the fastest public universities in Africa. It would be in this moment where he would have the honor of speaking to that large crowd in Ghana as he launches his brand new Drolor Center for Strategic Leadership, a resource program facility dedicated to educating and investing in leadership development for young professionals. "Africa is truly the last frontier," he tells the crowd of young aspiring business leaders, activists, and scholars. "Strong investment in leadership for our youth will give them what it takes to contribute to global development and make a lasting impact on the world." After recently receiving the top leadership prize at the West African Nobles Conference, Fletcher feels that now in his mid-fifties he has accomplished a lot that has inspired him to keep going. "The accolades and honors are a blessing, but my work is only going to continue to grow from here," Fletcher says of not stopping on his advocacy. As his renowned presence begins to make a profound impact in Africa, Fletcher's current public and motivational speaking engagements also has his attention focused on his black brothers and sisters in the West. His dual citizenship allows him to empathize with the current conditions and events in Black America, while also seeing this as an opportunity to forge a stronger cross-continental bond. "With all that is affecting blacks across the diaspora, now more than ever is a time where we should be supporting each other all around... we are all in this together and connecting our roots and really knowing each other again will be the solution," Fletcher says. At a time when society needs it the most, Dr. Kingsley Fletcher proves himself to be a man committed to not only challenging society's misconceptions on Africa's potential, but a leader personally invested in the well-needed restoration of black relations across the globe.